One-line review: a wrenching tale of the destruction of Hindu temples across the land, the crushing of a culture, the desperate and often doomed attempts to save deities from desecration and destruction, and the tentative, sporadic, diffident shoots of revival - more heard of than seen - point to a once-great civilization in the last throes of its inevitable end. 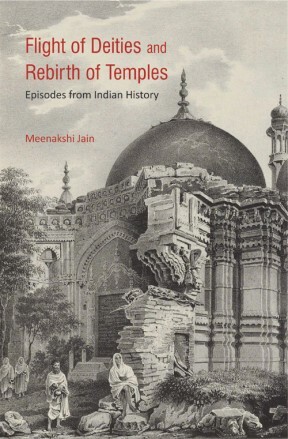 Short review: Meenakshi Jain's latest book chronicles the destruction of temples, Hindu, Buddhist, and Jain, over the centuries at the hands of mostly Islamic invaders, and the attempts made, where possible, by the faithful to preserve the deities by ferreting them out of the temples before the marauders came to destroy temples and idols. These attempts succeeded sometimes, and it would take years, decades, or sometimes, even centuries, for those idols to be retrieved and returned to their rightful place. In many cases, however, the idols were lost forever. Wherever temples were destroyed, there were consistent attempts to resurrect them and to revive the practice of worship there, but the scale was always diminished, the spirit subdued, a pall of fear hovering the faithful like a shroud, the prospect of a second, third, fourth round of destruction never far away. In some cases, like Kashmir, even the memory of temples destroyed has faded. While the rise of British colonialism would wreak further untold havoc on the economy and the spirit of the nation, the one good that seems to have come out from colonialism was the work done by British archaeologists in uncovering and documenting scores of accounts of temple destruction. After independence, any hopes of a revival of a faith suppressed for a millennia would soon be cruelly crushed. Between the criminal apathy shown by the Archaeological Survey of India, a rapacious state that took over the control and management of Hindu temples, starving them of funds and looting their lands, and an educational system that instills a deep sense of hatred of Hinduism among Hindus, it may not be an exaggeration to state that the final nail in Hinduism's coffin, in a manner of speaking, has been planted. Out of sight, out of mind - goes the adage. The same could be said about Hindu temples also. As the temples of the Hindus were destroyed across the land, so did the memory about places that had once been sacred for centuries or more fade. Adherents did what they could to sustain their faith, but even that diminished over the years as their numbers themselves diminished. Eventually, memories of sacred places and temples would live on only in oral traditions and sometimes written accounts. Meenakshi Jain's book is an account of the destruction of Hindu temples, their deities, the flight of some of those deities, and the sporadic and desperate attempts to revive those places of worship and return the deities to their original abode. Multan was first referred to its modern name by the Chinese traveller, Hiuen Tsang, who came to Multan in 641 CE, and called the town Mulasthanpura (city of the frontier land). Tradition held that Multan was founded by the sage Kashyapa, father of the twelve Adityas. Kashyapa's son, Hiranyakashyipu, was killed by Vishnu's incarnation, Narasimha, at Multan. The Sun temple at Multan was supposed to have been constructed by Samba, Krishna's son, who initiated Sun worship in the town. Another temple at Multan, the Prahladpuri temple, was where the festival of Holika dahan commenced. To say that Multan was an important and sacred city in the geography of Hinduism would be an understatement. As was the case with the Indian subcontinet - including modern-day India, Pakistan, Bangladesh, Bhutan, and Nepal - all its kings and emperors were Hindus, or in some cases, Buddhists. The last Hindu ruler of Sindh (now a province in the southeast part of Pakistan) was Dahir. After a two-month siege of the city in 711 CE, 'it finally fell because one of its inhabitants pointed to a weak section of the walls which Qasim promptly breached.' The temple however was saved, not because of the munificence of Qasim, but because the the people of Multan agreed 'to surrender one-third of its income.' One-third of the money that each pilgrim donated was given to the Muslims, one-third given for the improvement of the city and its fortifications. One-third was what was left for the upkeep of the temple. It may be tempting to draw parallels with modern, independent, and free India, where Hindu temples continue to be under government control, the money donated by the faithful usurped by the government, and a fraction of it given back to the temple. If temples were no more than a non-religious link between the divine and the king, as propounded by some scholars, it defies explanation why the people agreed to such an expensive bargain to save the temple. In any case, the temple did not survive for long; in 986 CE, it was destroyed by the Karmatians, a branch of Ismaili Shia Islam, and idol broken to pieces and the priests killed (according to Alberuni). When an inquisitive Qasim was informed that the key to the city's immense treasures and its prosperity was the Sun temple and the idol there, Qasim 'left the idol where it was, but hung a piece of cow's flesh on its neck by way of mockery'. Any comparisons that may be made with a recent event in the state of Kerala, where a politician from a leading, national political party slaughtered a cow as a way to mock the religious beliefs of Hindus, or when some intellectuals held a beef-eating festival - again as their way of mocking those Hindus who venerated the cow, are left to the reader as an exercise. The political power that sustained the temple had been long gone, but the faithful 'succeeded in re-establishing the temple and image'; and the Sun god's worship was continued by the remaining Hindus. Eventually, however, by the middle of the thirteenth century, 'the only image worshippers left in the city resided in the precincts of the temple'. The Sun temple was devastated in the reign of Aurangzeb and a Jama Masjid constructed at the site. Modern, educated Hindus, proud of their secular credentials, confident of their intellectual caliber, proud to associate with other, like-minded not-religious-but-spiritual types, will quickly identify Multan as the site where legendary Indian cricketer Virendra Sehwag became India's first test triple-centurion. Its Hindu heritage and the destruction thereof is not worth even a footnote. The Narasimha pillar at Multan. It is at this temple of Sharda that Shankaracharya was accepted as a religious scholar of the highest merit. When the king of Gujarat asked the Jain scholar, Hemachandra (1088-1172 CE) to compose a new grammar, the latter requested the king 'that he be provided with old grammars that could only be found in the library of the Sharda temple'. The Iranian scholar and historian, Alberuni, described the shrine of Sharda as being much venerated and frequented by pilgrims. By the end the 19th century, however, the shrine was 'almost unknown to the pandits of Srinagar.' Aurel Stein, the Hungarian-British archaeologist, found that the shrine was bereft of any ornamentation. Some forty Dogras and Sikhs were all that were left who took interest in the shrine. One of the rulers, Sultan Sikanar (late 14th, early 15th century CE), was so fanatical that he inspired over seven hundred Sayyids from Persia to migrate to Kashmir, and which led to another wave of religious persecution of the Hindus there. Sir Walter Lawrence wrote that 'the persecution of Hindus was so keen that only eleven families of Hindus remained in the valley'. Having destroyed the temples of the Hindus, Sikandar offered the Hindus 'three choices , death, conversion, or exile'. On the 19th of January, 1990, when the Kashmir Valley reverberated to the screams of 'Ralive, Tsaliv ya Galive' ('convert to Islam, leave the place or perish') from loudspeakers in mosques, we should all believe one of the three - that it was all a fabrication of the central government, that the quarter million Kashmiri Pandits who left their home of millennia did so voluntarily, and that the call from mosques had nothing to do with religion. And certainly, the call to convert, exile, or die had no historical precedent. The Sharda temple, in 1870. From Flight of Deities. Sharda temple, in the 21st-century. From Flight of Deities. No mention of temple destruction at the hands of iconoclasts, or of unending resistance by Hindus, or the equally tireless efforts to revive sites revered by Hindus, can be complete without mentioning Somnath. Prabhas, close to the Somnath temple in Gujarat, is of immense importance to Hindus. It is mentioned frequently in the Mahabharata and the Puranas, and has several associations with the Hindu faith. The history temples at Somnath goes back almost two-thousand years, the author writes. The first temple, of which no structural evidence remains, may have been constructed in the first-century, CE. A second temple, dating back to the seventh century CE, was believed to have been destroyed by the Arabs. The temple was built again a few years later and later embellished. Despite these depredations, the local Hindu ruler provided help to a merchant from Hormuz, Nuruddin Firuz, to purchase land and build a mosque in the town of Somnath. Arabic inscriptions noted Nuruddin's instructions to the faithful the surplus income be sent to places of worship - at Makha (Mecca) and Madina (Medina). A few decades later, the Somnath temple was repaired and the linga re-established by the king of Junagadh. A few decades later, after Muzaffar Khan's expedition to the place, while the temple was not destroyed, a mosque was built at Somnath and worship at the temple may have stopped for some time. A few decades later, in 1413 CE, Sultan Ahmed Shah 'desecrated the temple', and in 1469, his grandson, Sultan Mahmud Begada, 'removed the linga and converted the shrine into a mosque'. In the seventeenth century, the temple at Somnath was defiled, 'and in 1701, converted into a mosque on the orders of Aurangzeb'. It was Maharani Ahilya Bai Holkar who had a new temple constructed in 1783 near the old Somnath temple. It was only after independence that a new temple was constructed at the site of the old shrine and the existing mosque relocated. The installation ceremony was presided over by the President of India, Dr. Rajendra Prasad, much against the wishes of the prime minister, Jawaharlal Nehru, who saw the reconstruction of the temple as 'Hindu revivalism'. In 1963, when Dr. Prasad died, a retributive Nehru not only did not attend his funeral, but also advised the then president, Dr. S. Radhakrishnan, against going to Patna for the funeral. In much the same spirit of iconoclasm that Muslim invaders had displayed over the centuries, the Portugese felt an obligation to outdo them in both barbarity and intolerance. While the brutality and unspeakable tortures inflicted upon the hapless Hindus of Goa by the Roman Catholic Church have been well-documented in A.K. Priolkar's book, 'The Goa Inquisition', a few instances are worth recounting to bring home the point I make subsequently. In 1560, the temple of Saptanatha was destroyed by the Portuguese and a chapel constructed at the site with material from the demolished temple. In the Salcete territory, all temples in 58 of the 76 villages were destroyed, The Jesuits estimated the big temples to number 280, while the small temples were 'innumerable'. The wood of the Lakshmi temple in Sancoale village was utilized in making the church of St Lourenco. no Hindu festival should be publicly celebrated in the whole island. It would be three hundred years of persecution before the Portuguese would permit a Hindu temple to be built in Goa - in 1818. It is too tempting not to point out the similarities that exist in this template of religious intolerance that lives on in a supposedly free India. A Christian convent expelled a girl for wearing kumkum; a Christian school principal in Tamil Nadu issued an edict barring students from coming to school wearing the sacred thread on their hands. A Kerala government school principal had gone further and promised expulsion of any student found coming to school with Hindu religious symbols. As is often said, Hindus attained independence in 1947, but have become even more firmly mentally enslaved in the ensuing decades. It is this destruction of 27 temples and the disfigurement of the idols and pillars that has been labelled by some academics as nothing more than 'recontextualization'. If 'recontextualization' has to be entertained even for a moment, it is instructional to compare and contrast the above with the example of how a Hindu king understood 'recontextualization'. The Rajasimhesvara temple (now known as the Kailasnatha temple) in Kanchi was built in the early eighth century by the Pallava ruler, Rajasimha. Such was its architectural beauty and exquisite sculptures that it inspired the Chalukyan temple at Pattadakal and the Kailash temple at Ellora! What about the original temple? When the Chalukyan king, Vikramaditya II, conquered Kanchi, he gave a gift of gold to the shrine, and 'took back some artisans from Kanchi to his kingdom, where the Virupaksha temple at Pattadakal was built'. Yes - he did not take the idol from the temple for it to be trodden underfoot, nor did he order the idol to be broken into pieces, or hang a piece of cow's flesh around it, or disfigure the sculptures. His interpretation of 'recontextualization' was more in line with Hinduism's civilizational underpinnings. In 1669, Aurangzeb issued a general order for the demolition of Hindu schools and temples, and in 1670, specifically ordered the destruction of the Keshavdeva temple. The deity was taken to village Rasdhan in Kanpur. The temple itself would be reconstructed only in 1965, after Jugal Kishore Birla formed a trust to which the land rights were transferred. The land had been acquired at the behest of Pandit Madan Mohan Malviya in 1944. Aurangzeb's edict led to a mass exodus of the deities, and most were taken to Rajasthan. The Amer ruler, Sawai Jai Singh, used his standing in the Mughal court to get the conditions of Hindus improved. It was in 1728 (after the death of Aurangzeb) when the pilgrim tax at Gaya was abolished. In 1730, 'the long-standing tax levied on Hindus at certain bathing sites was withdrawn'. Other places were not so fortunate. In 1194 CE, after the assault by Qutubuddin Aibak, military commander of Muhammad Ghori, 'hardly a shrine survived' in Varanasi. The last round of destruction was at the command of Aurangzeb. The net result was that the 'Benares of the Puranic mahatmyas was completely obliterated'. The present-day Vishwanath temple was built by Ahilya Bai Holkar in 1777 CE. Five years earlier, in 1665, Aurangzeb had also 'prohibited celebrations of Holi and Diwali, and cremation of the dead on the banks of the Yamuna'. Readers are encouraged to study similarities with modern day events, like the ban on Diwali celebrations in the national capital and other parts of the country, or edicts by public intellectuals against Holi, or the demand by a certain regulatory body calling for the banning of cremations on the banks of the Yamuna. In response to the murderous assault on Hindus and their faith, innovative was the response of the Hindus to continue practicing their faith when neither temples nor images were safe. Kirtan, bhajan, katha, and lila acquired popularity - where the human being substituted for the image in the case of the lila, for example. 'Lilas are said to have originated in Benares, during or shortly after the lifetime of Tulasidas. Their performance at the outset was linked to the Ramcharitmanas'. In case readers are unaware, some modern-day historians have attempted to portray the rise of these forms of worship as nothing more than a reactionary protest against Brahminical oppression. Ponder over that. This template of keeping temples away from the eyes of the iconoclasts was extended to other places too, including Rohtas, Amber, and even Varanasi, where Ahilya Bai Holkar's Vishwanatha temple was built on a side lane of the Gyanvapi mosque. Such compromises helped keep the faith of the Hindus alive in a time of immense persecution. Unfortunately, after India achieved political freedom, the nation's leaders chose to continue with a policy of Hindu subjugation - whether out of a sense of ingrained inferiority, or out of the need to continue the millenium-old tradition of subservience, it is not clear. Nor has it been adequately studied, in my opinion. Afzal Khan met his match and death in his encounter with Shivaji at Pratapgarh in 1659. But this was not before Afzal Khan had wreaked havoc and destruction. On his way to Pandharpur, he destroyed all temples he could find there, after having desecrated untold temples at Tuljapur. The temple priests at Pandharpur, however, had the idol of Vithoba removed, possibly to Madhe. Similarly, 'during the reign of the Deccan Sultanates (15th-17th centuries), the image was shifted from Pandharpur on numerous occasions'. Mahalakshmi was one of four deities widely worshipped in Maharashtra. The other three were Bhavani of Tuljapur, Khandoba of Jejuri, and Vitthal of Pandharpur. The Rashtrakutas, Kadambas, and Silaharas dynasties considered Karvirvasni Mahalakshmi (modern-day Kolhapur) as their family goddess. Kolhapur itself was known as Dakshin-Kashi. Under threat of desecration from Muslim rulers, the deity was under constant move. The image of Ambabai (Mahalakshmi) was hidden in a private dwelling, even as the temple was desecrated, sometime during the fourteenth-fifteenth centuries. It would not be until Dasara in 1715 CE when the image was reinstated, at the command of the Maratha emperor, Sambhaji Maharaj. The same year, the Vitthal image was reinstated at Pandharpur. Similarly, it is acknowledged that the Vitthal temple at Hampi, the capital of the Vijayanagar empire, was rated as 'magnificent'. There was a widespread belief in Maharashtra that 'when Pandharpur was confronted with a Muslim threat, Krishnadeva Raya took the image for its security, and it was returned in safer times'. There are many similar incidents of deities being transported out of temples by the faithful. When compared to the number of temples destroyed in India by the iconoclasts - estimated to be in the tens of thousands - the number of deities transported to safety is but a tiny fraction. The fate of the vast majority of deities was to be defiled, desecrated, and destroyed. Eighty-eight temples in Thanjavur ... hardly get anything from temple lands; tenants either pay paltry rents or default. A law enacted by the AIADMK protects them from eviction'. In November 1983, the Brihadeesvara temple in Thanjavur (Tanjore) did not open in the morning as there was nothing to offer the deity. In December 2018, it was reported that the famous four hundred year old Agastheewarar temple in Chennai city had been sold off by temple trustees - the value of the temple land was Rs 1800 crores. An arrack shop adorned the entrance of the Sriranganatha temple. A VIP guest house with a toilet in the compound of the Sri Arunachaleswara temple in Tiruvannamalai was built. The once resplendent Siddhi Vinayagar temple, also in Thanjavur, is in ruins and kept locked, except for a brief spell in the morning when a poorly paid priest performs nominal puja. Bold letters on the temple dome declare 'Full DMK', connoting that the temple walls have been reserved for DMK slogans. The Archaeological Survey of India had been able to recover only 19 items between 1970 and 2000, and none - yes, as in zero - between 2000 and 2012. When I wrote 'criminal apathy' of the ASI, it was not without reason. The HR&CE is not far behind, as has been seen above. Much of the continuing desecration and theft of idols has been recounted in S. Vijay Kumar's riveting account, 'The Idol Thief: The True Story of the Looting of India's Temples', that I had reviewed. So how does one look at the book, "The Flight of Deities"? As with her earlier books, the author has done an outstanding job in sourcing her facts, and in putting them together into a cogent, coherent presentation. While she admits that the organization of the book into chapters based on geography is unsatisfactory, I am not sure if any other organization would have been significantly better. In many ways, this book can be seen as an expansion and more readable successor to Sita Ram Goel's magnificent work on Hindu Temples - 'Hindu Temples: What happened to them, Vol.1: A Preliminary Survey', and 'Hindu Temples: What Happened to Them, Vol.2: The Islamic Evidence'. 'Flight of Deities', however, adds two important sections. First, it documents, where available, the efforts that devotees took to protect their idols from the assault of the invaders, and second, how temples destroyed were sought to be revived by Hindus. That this was done in the face of what would surely have seemed like a never-ending night of despair is humbling beyond words, and puts in context the abject cravenness with which political leaders of our nation have abdicated their duty towards the faith of a billion people. The last section of the book, that briefly documents the apathy shown towards Hindu temples, is a most depressing tale of apathy, corruption, incompetence, and institutionalized Hinduphobia. Let this book become a part of your bookshelf. Read a page or two from it every day. Read aloud to your children. Preserve the memory of the land as it was. Remember the despoliation it suffered. Honour the sacrifices made by the faithful. Repay the debt you owe to the culture, faith, civilization that has nurtured you and your ancestors. Disclosure: I received a complimentary copy of the book from the author. This review was first published in MyNation on March 12, 2019. © 2019, Abhinav Agarwal (अभिनव अग्रवाल). All rights reserved.